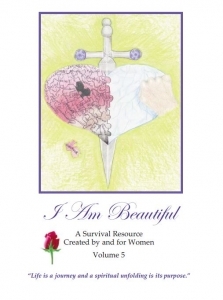 The following blog post was written by Heather, a female inmate, for Volume two of the I Am Beautiful book series. I’m dying inside–you say I must be strong. Better days are coming, but miserable nights are much to long. The ringing of a telephone summoned the knowledge of your death. The hurt hangs heavy, despair hovers over my head. People walk right past me and don’t see this look in my eye. Deep inside is the urge to just give up the ghost and die. I lost my mind the moment that they laid you in the ground. In the day I wander aimlessly and at night I jump at every little sound. I’m afraid they’ve taken me to places I wish I’d never found. I am your child and from your flesh and blood I come. Same attitude same lifestyle same obsession with this filthy game. Now it finally hits me; you’re never coming back.